This card was inspired by the Stamptacular Sunday Challenge--Design Team Inspiration! They have a great bunch of talented girls at their challenge blog. 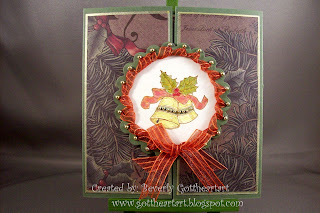 Annette from Studio A Paper Creations really inspired me with her card. She used a Spellbinders Nestability to make the wreath on the front of her card and a Meljen's digi, a very spring like card. My mind immediately went to a Christmas card using these new papers from Stampin Up and this new stamp set Bells & Boughs. However, I do not have the die she used, so after mulling over several ideas, short of ordering the die, this is what I came up with. A scallop Spellbinder Nestability die that I cut the center out of , a 1/16" hole punch, and a length of ribbon, I carefully threaded the ribbon around the inside of the circle, knotted it at the bottom and tied a bow to go on top of that, hence 4 tails. It looked a little plain to me, so I added the gold metallic dots, which when I stamped and embossed the bells with coffee ink and clear embossing powder, colored with Copic Markers, I added the tiny gold metallic dots and that just set the whole thing off for me. I loved the way Annette attached the long triangles to the inside flaps, so I copied that. This is a 5 1/4" square gate fold card, the left side of the wreath is permanently attached and I put a small amount of dotto non-permanent adhesive to the right side to hold it temporarily closed. Hope you like this one as much as I do. Stamptacular Sunday Challenge Challenge #84-Design Team Inspiration! Raise The Bar Challenge #43-Let's See Those Curves! Supplies: 5 1/4" square gate fold card, Papers: Stampin Up-Always Artichoke, Cherry Cobbler, Very Vanilla, Designer Series Paper Deck The Halls, Stamp: Stampin Up-Bells & Boughs, Ink: Ranger Archival Ink-Coffee, VersaMark Ink Pad, Stampin Up-Cherry Cobbler, Stampin Up clear embossing powder, Copic Markers, Sharpie Poster Paint Pen-gold, Sakura Gelly Roll Pen-gold, 1/16" hole punch, Fiskars shape cutter template-Circles-1, Spellbinders Nestabilities-Classic Scallop Circle Lg., ribbon-Michael's, Recollections-gold metallic dot stickers, Scor-Tape, dotto. Beautiful card Bev. Love the ribbon wreath with the 4 tails which looks really extravagant. Thank you for sharing with us at Bah! Humbug! Oh my Bev, what a gorgeous, gorgeous card! I love the christmas theme, the image, the simple embellies & those elegant papers - an absolutely perfect combination! Simply elegant! Thank you for your lovely comments, I am so very happy to have inspired you to create this stunning card! Thanks for joining our DT inspiration challenge at SSC. Good luck & hope you'll play again! Beautiful card, love the papers and the lovely image. Thanks for joining us at Bah Hubug this week. I love the twisted ribbon!! Thank you so much for playing along with us at Paper Issues!! I know I should be commenting on your fancy folding Bev but that ribbon weaving just blew me away. Wow it's gorgeous. 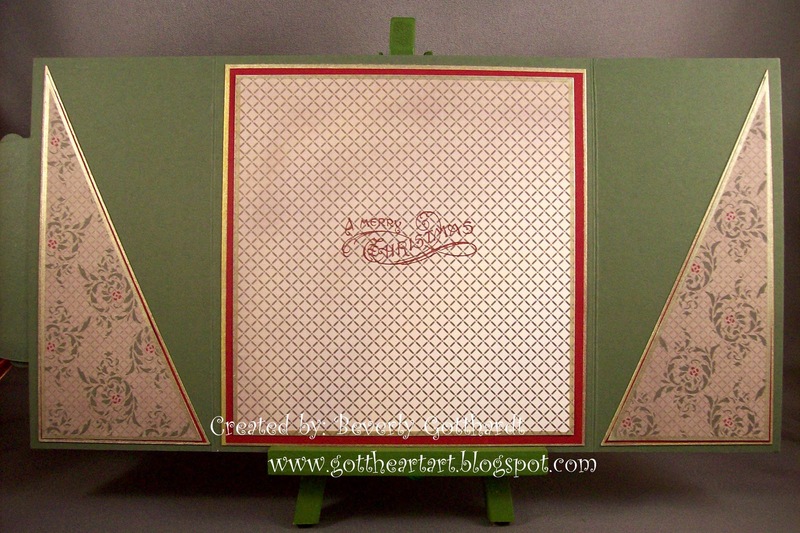 What a fabulous scallop fold card - I love it. Your design paper is gorgeous and I LOVe your ribbon wreath, with a perfect image in the centre. Beverley, such an elegant card. Wow Beverley. This is just fabulous. I love this design. Great idea using Annette as an inspiration. I'm loving the circle on the front of the card. Thanks for sharing it with us at our DT inspiration challenge at SSC. O this is really Beautiful. So glad Annette inspired you to create this. Thanks for joining us at Stampatacular this week. Ph Bev, big congrats on making TOP 3 at SSC! Beautiful Christmas creation! Thanks for sharing your project with us at Polka Doodles this week. Lovely Christmas creation! Thanks for entering the Polkadoodle Challenge - hope you can join us again next week! Thanks for taking part in Polka Doodles quick Christmas card challenge.